What is the picture that comes to your mind when you say English Apple or Plum Orchard? Do you perhaps think in terms of village settings with rectories, or Georgian houses with stone walls and venerable apple trees with bark encrusted with lichen, grass beneath, chickens ranging around, a swing made of stout rope and a plank dangling from a huge branch? Do you perhaps think more commercially like the Cider Orchards in Somerset, where small producers have sheep grazing their orchards? As townies we visited the Hampton Court Palace Flower Show each year and gazed at the idyllic country gardens/orchards/allotments that were laid out in the Daily Mail Pavilion to showcase the gorgeous cottage we could win if we collected enough coupons to enter. It is very hard when you are swept away in the moment to remember that show gardens are a snapshot in time, that the plants are brought forward or held back to look their best for the show and may not really flower together, never mind the practicality of gardens and free range chickens, and to try to imagine what it would look like for the other 360 days of the year. However, when we moved here we inherited an orchard. Really. Venerable apple and plum trees - tick; lichen encrusted bark - tick; grass - tick; stone wall - not so much. The orchard occupies the bottom 46 metres or so of the garden and has the steepest slope – more than 1:10 and is bordered by a collapsing chain link fence about a metre high on one side, and a 2m high feather edge fence on the other. Very roughly the trees are in two lines down the garden, though being different sizes and therefore planted at different distances apart it doesn’t look uniform. In my mind's eye, I was thinking spring blossom with spring bulbs underneath in carpets through the grass. 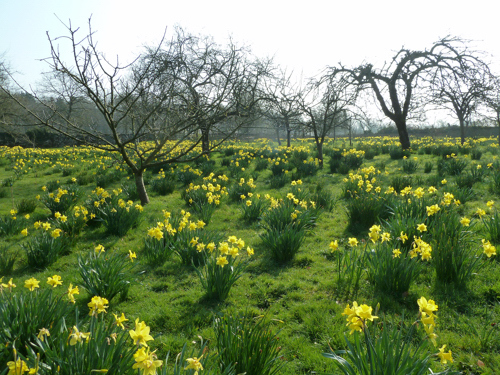 Rather like these daffodils in the National Trust’s Sizergh Castle’s orchard, taken at the end of March 2017. My husband was thinking chickens free-ranging round the orchard in cages/runs that could be moved as they exhausted each bit of ground. Those of you who keep chickens will know that chickens will wipe out all greenery in their run as they scratch around. Bulbs would stand no chance. My husband agreed that chickens would be a future project. However, he was extremely adamant that I could not have carpets of bulbs all through the orchard as the grass had to be kept shortish so he needed to be able to mow it, and we had to be able to walk through the orchard. Negotiations ensued. I was not helped by the fact that my Mother had naturalised daffodils in her front lawn under a big tree, which had caused ructions when the grass could not be cut whilst they were flowering, and then, most contentiously, whilst the daff leaves were yellowing and dying for eight weeks in a manner most unsightly and upsetting to the males, especially as Gardeners World said the leaves could not be bent round and secured with an elastic band to keep them “neat”. In the border the leaves are covered by other plants growing up round them. As in this picture where the daffodil is growing through Geranium endressii. A compromise was agreed where I could plant daffodils round the trunks of the trees to an agreed circumference, and there was to be a “golden triangle” towards the middle of the orchard which went between two apples and a plum which already had Aquilegia vulgaris round its base, and spreading their purple blooms across toward the apples. Here I was to be allowed to put in bulbs safe in the knowledge they would not be mown down before their time. The first spring we were here we found that the plum blossom in the orchard is gorgeous turning the trees into brides in bouffant white flowing outfits, some years from the middle of March. 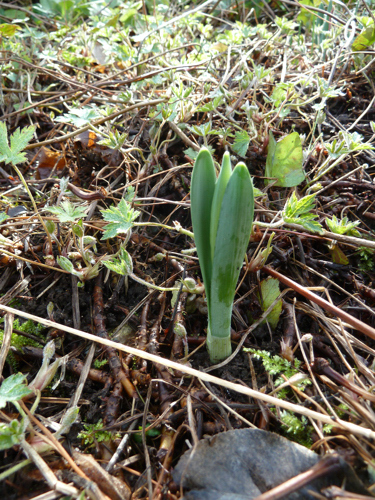 Here is a view of that lovely blossom – with some daffodils please note – on the 16th of March 2015. This year the plum blossom was not out till the end of March. It is followed by the pear blossom, and then apple blossom in its pink and white glory later in April. 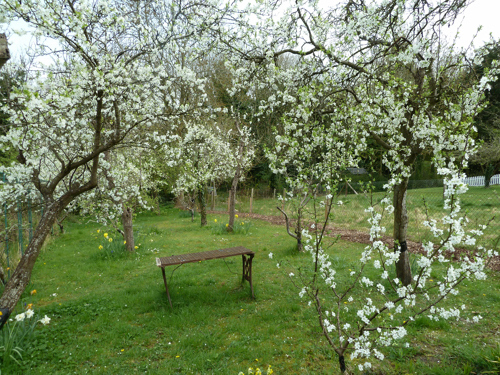 In this next picture you can see the apple blossom with fresh green leaves on the trees behind – the plum trees, blossom over already on 21 April. 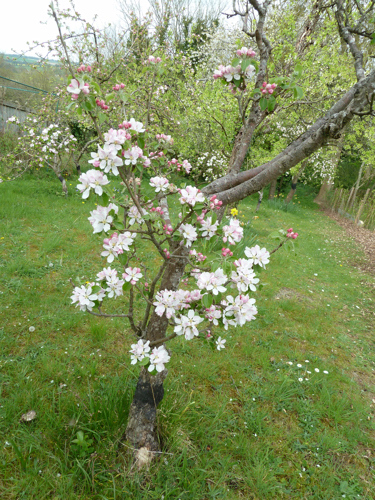 When you add the fact that the apple trees are grouped with early and late apples, and therefore earlier and later blossom, whilst on the one hand you could view the spring blossom as very transient, on the other, depending on the winter weather, it can be flowering from early March to the end of April, and I wanted bulbs to compliment that. Now you are probably noticing one problem I had not anticipated with this daffodil – the flowers are very heavy being double and the plant bends to the ground. The flower gets muddy and damaged very quickly. I did not want to stake each one (it is supposed to look natural!!) So I have not put any more doubles in, going for cultivars like Narcissus cyclamineus ‘Jet Fire’, which as you can see here is shorter with a smaller flower head so that it stays erect in our windswept garden. I had expected that the bulbs would spread, and make a golden collar round the trees. However I did not bargain for the squirrels and badgers. They have gradually dug up or eaten most daffodils, particularly the expensive named ones (they obviously taste better than a mixed bag from the market!). I do replant some each year, but they are not naturalizing as I had hoped. 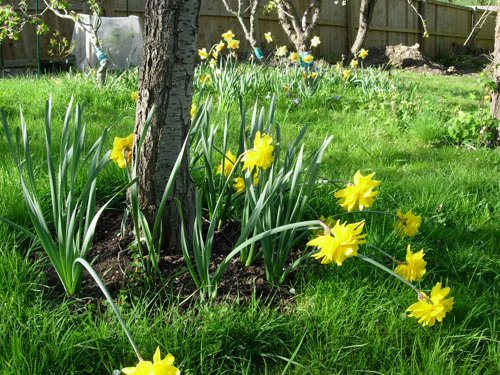 The Golden Triangle was populated with any “stray” daffodil bulb discovered elsewhere in the garden (or anyone else’s garden) that needed a new home, and as the years passed, with other spring bulbs such as Camassia or grape hyacinth. Together with the spreading Aquilegia, it is more a blue triangle at times than a golden one nowadays but floriferous in spring over a long period. I also wanted to have a native bluebell wood at the bottom of the garden under the cooking pears and apple trees, possibly looking a bit like this one near us. We have a lot of the Spanish Bluebells (Hyacinthoides hispanica) in the garden – going down the paths from the house as you can see here. But these are like comparing a grey squirrel to a red – bigger, coarser, weedier colour. 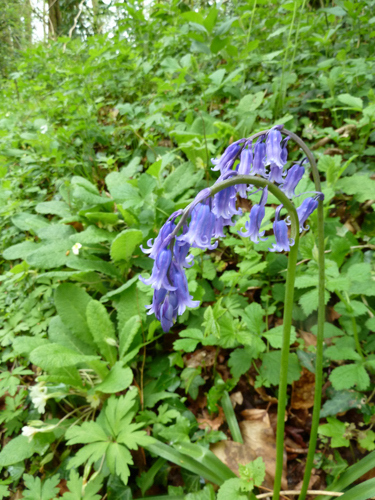 The English Bluebell has a colour intensity and scent that are intoxicating. 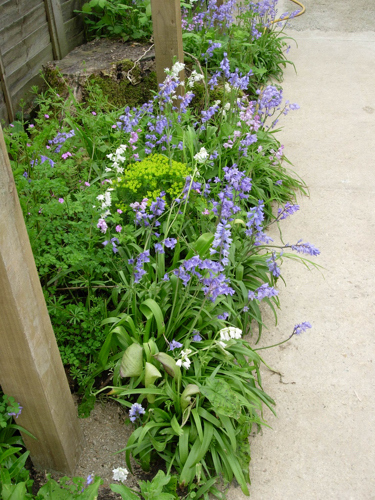 For my birthday in 2006 I was given 100 English Bluebells (Hyacinthoides non-scripta) bulbs. 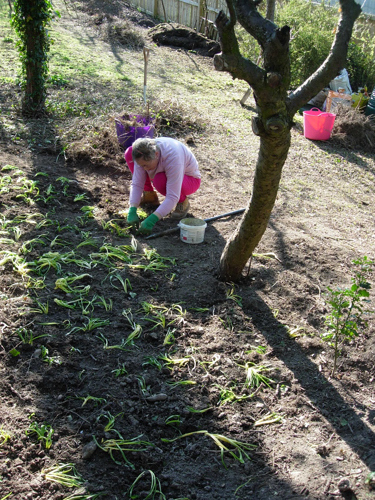 Here I am planting the bulbs – in the green – into the ground in April 06. You may notice I am not using a spade or bulb planter to make the holes. The ground was so full of tree roots that I am using a builders steel spike called a demolition crowbar. We religiously weed out any Spanish bluebells that have got past the Silver Birches over 35m away, to ensure that there is no cross fertilisation. I have kept my fingers crossed the English Bluebells would like our garden and spread as they do in nearby woods in Hampshire. No such luck. We had two very dry summers after I planted them, and I think they did not get enough moisture whilst they were settling their roots. I was patient the next year when we got leaves but few flowers, but they did not gain traction, and the Anthriscus sylvestris (Cow Parsley) seeded into the cleared ground and grew round them making it most difficult to weed as I was disturbing the bulbs more than the weeds when I tried to get the Cow Parsley out. I still get a few bluebells, but by no stretch is it a 'carpet'. 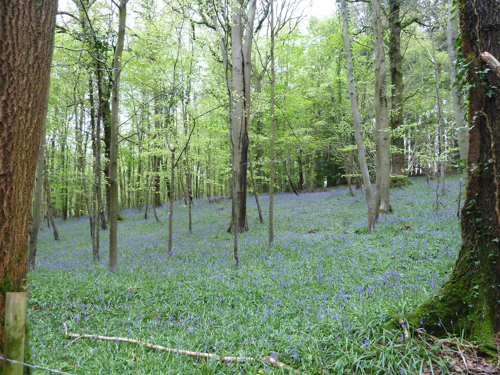 I now content myself with visiting local bluebell woods to drink in the colour and scent towards the end of April. To further get a fix of blue in April I have also put in Chionodoxa forbesii (Glory of the Snow) and Brodiaea laxa 'Queen Fabiola' under one plum tree further up the orchard. Each year I think they are not coming up, and then all of a sudden there they are, the Chionodoxa are even spreading a bit. As I thought about how to explain my design ideas for the spring bulbs to you, and found pictures of my inspirations, I realised that it would seem to you I had been thinking big, very big, and wide, and had failed to literally deliver this. Inspiration is a stepping stone for me, giving me a colour/feeling/planting combination. When I design I have to adapt my inspirations to fit the actual garden dimensions, conditions and topography, and the use we wish to make of that part of the garden. I was not seeking to replicate one idealised image, but to make a pleasing space with spring colour that lifts my heart and delights my senses. It has given me a learning point - I have to work with nature (and badgers and squirrels), and now put choice bulbs in the gated garden nearer the house to protect them from being dug up. 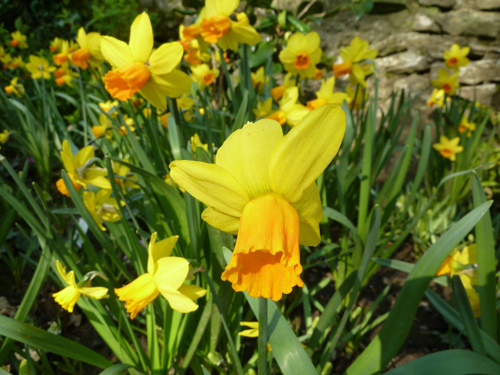 The daffodils that remain do flower throughout the time the blossom is out, and provide a welcome splash of yellow. I now also get small areas of blue as a contrast. I have also thought wider than just bulbs and transplanted some turf from elsewhere in the garden which has cowslips in it, so that they are beginning to colonise the orchard. I will never have beautiful old stone walls, but as you know I am also working on one of the boundaries – the chain link fence is being fronted by a mixed native hedge (see my second blog post) which was planted in December 14, so the nature of the orchard will change again in the next few years. As we all know, a garden is never finished. Next time – what did we find in the garden in that first year we were here? 0 Comments To "On a Chalk Hillside April 2017"